Well, hey, there’s something totally new today at Bike Hugger. We’ve rolled out our Hugga 2.0 design and architecture. Like a bike shop handing someone a new bike, we want you to try it out for a while. Tell us what you think. We’ll make adjustments and fine tune everything, after a few miles. One immediate change for our commenters is a login. It’s fast, non-intrusive and also opens up more community features. We think we’ve now got the best blog archives evar and have worked on rectifying what we call blog vernacular architecture. That’s an architectural term applied to web design and defines when a blog is rearranged to someone’s liking. As opposed to a thought-out, well-designed space, we just bolted on new features during the past 2 years. In other words, we outgrew Hugga 1.0, and it got messy and rather hard to find anything. Our new community features and “social publishing” are powered by Movable Type Pro. I won’t bore you with all those details here – will later in my talks and panel at SXSW. The app is built with blog goodness and a remarkably, Über-powerful architecture. Jay Allen built the back end and really pushed MT further into the content management realm than we’ve ever gone before, even to the point of turning it into an elegant event management application. It’s highly modularized with some hot plug-and-play action for easy maintenance. That means less time yelling at software and more time riding the hills around Seattle. Speaking of event management, the Mobile Socials have their own pages now with a collection of related posts attached to them. We want to offer at-a-glance data and all them details. 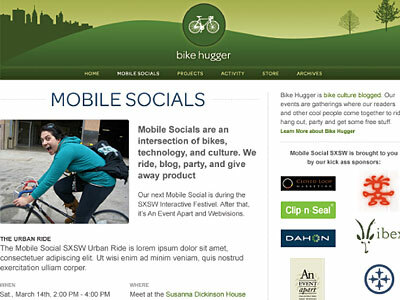 The next Mobile Social is at SXSW. Get a couple beers in me there during the BBQ and I’ll get into the whole, “I love you man and the new blog” thing. We’ve got feeds for our blog, Mobile Socials, tags, and authors. I think we’ve got them for comments threads as well. There’s a new Motion-based Activity Page, that displays all we’re doing here at at Hugger Industries (collection of Hugger properties) and Textura Design (parent of Bike Hugger). We do a lot on the interwebs with blogs, social media, and those Mobile Socials. We know that confuses the bike industry mostly (because they tell us so). Our plan is to plod forward, keep building an audience, and they’ll eventually figure it out. The partners we have now are on board with what we do and cool. Thanks to them for making this possible. We believe that cycling is bigger than the industry itself. Bike culture is part of popular culture and what we focus on. See an example of that from last week at the Amgen Tour of California. No. We’re dreamers and silly hearts, twiddlers, and jabberboxes. Back to Hugga 2.0. It’s out. We’ve spent much time on it – too much. So please, treat it like a new bike: go for a ride and tell us all about it. We’re listening and already working on version 2.5. Fonts, spacing – our designer, Scott Benish, is pixel checking now the tight spaces, bullets, and whatever other weirdness that got built but was not on the comp. Best viewed without Internet Explorer – we’ve got a few issues on the archive page with Internet Explorer we’ll get to those, later. Activity page; cool, but it’s rather hard to look at. Cleaning that up.